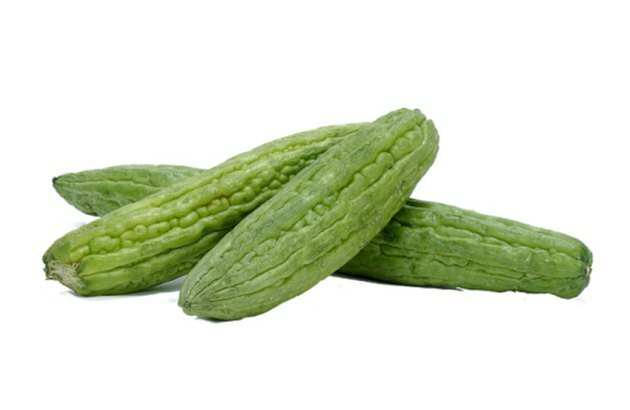 If you are trying to lose weight and you are looking for diet-friendly foods to enjoy, you might want to consider bitter gourd, which is also called bitter melon or balsam-pear. The plant is common in Asian cuisine, and you can use it in a variety of recipes. Keep in mind that no single food determines your weight loss -- you have the best chance of weight loss success when your diet is balanced. Bitter gourd is effective for weight loss if you use it to reduce your total calorie intake so that you are eating fewer calories than you burn. This calorie deficit is essential for losing weight. Most vegetables are diet-friendly choices because they have a low calorie-density, so you can eat relatively large portions without getting too many calories, according to the Centers for Disease Control and Prevention. Raw bitter gourd pods have 16 calories per cup, and leafy tips have 14 calories. Bitter gourd is filling because it is high in water, which contributes 89 to 94 percent of the weight of the pods and tips. Water is calorie-free and is a natural appetite suppressant, according to the University of Michigan. Bitter gourd pods have 2.6 g dietary fiber, or 10 percent of the daily value, per cup. Dietary fiber slows digestion to make you feel less hungry, and a high-fiber diet may help you control your weight, according to the 2010 Dietary Guidelines from the U.S. Department of Health and Human Services. Use bitter gourd in low-calorie, filling recipes, such as vegetable soups or stews. Another option is to eat it as a side dish with lean protein, such as chicken breast, fish or a soy-based vegetarian burger. Bitter gourd has 1.6 to 3.5 g total carbohydrates per serving, so you can use it in a low-carbohydrate diet plan. Low-carbohydrate diets are possible weight loss approaches. When you are limiting your food intake to lose weight, it can be difficult to meet your nutrient needs. Bitter gourd is a nutrient-dense choice. Each cup of pods or leaves provides at least 70 percent of the daily value for vitamin C, and at least 9 percent of the daily value for vitamin A. Bitter gourd is sodium-free. To lose weight, be sure to cook it in low-calorie recipes instead of getting a high number of calories from oils, cheeses or other ingredients.